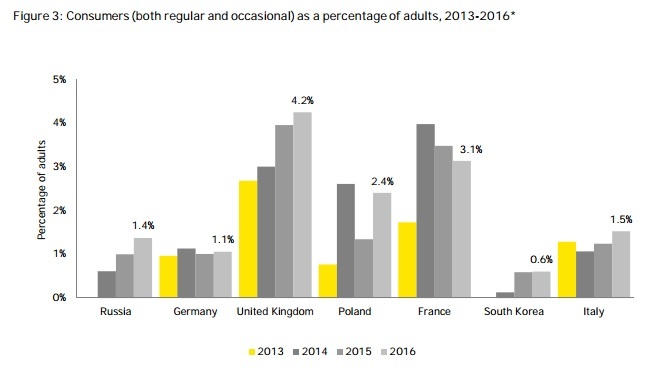 One of the 'Big Four' accounting firms, Ernst and Young (EY), has today released a report on e-cig use in seven 'core' countries between 2013 and 2016. The results are quite interesting, especially for UK vapers ... take a bow boys and girls. The British public are switching from traditional cigarettes to vaping devices (e-cigarettes) faster than anyone in Europe. In the last four years, the British have switched to vaping at the rate of one person every four minutes. The EY report shows that 2.2 million British people now use e-cigarettes – this is up by 55% in just three years. In total, 4.2% of British adults vape. France has the next highest penetration at 3.1%. In your face, cheese-eating surrender monkeys! There are many other revealing stats in the report, such as how the vaping market has more than doubled in size since 2013 and - much to the chagrin of 'public health' dinosaurs who like to pretend e-cigs are a plot by 'Big Tobacco' to drive tobacco consumption - how dual use is declining rapidly in favour of sole use. Meaning that if tobacco companies really are investing in e-cigs in order to encourage dual use and therefore revive tobacco sales - as many deluded (or deliberately doubt-fostering) tobacco controllers claim - their cunning plan looks to be failing spectacularly. Something the industry-hating tobacco control community will duly celebrate, no? EY also report that over two-thirds of e-cig users prefer to buy 'modular' devices, described as "can be refilled by the user, but also allows the user to regulate the power delivered from the system’s batteries to the atomizer". This must also come as a bit of a blow to tobacco control conspiracy theorists who like to tell the world that 'Big Tobacco' is a majority supplier of e-cigs to consumers; they aren't, because the tobacco industry sells very few devices which fit that description. 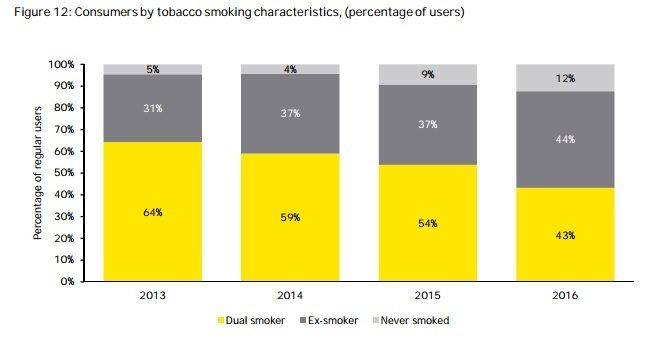 However, probably the most damning statistic EY has presented is on the drivers of e-cig use. In the UK, prevalence is still climbing despite furious scaremongering tobacco control junk science being published regularly in the media. However, it has declined in France where the government has been joining in with the hysteria. 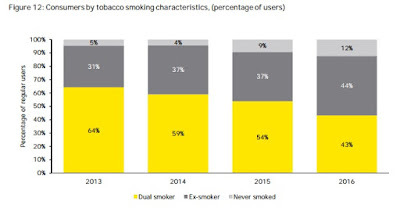 The EY report discovered that around half of smokers enjoyed smoking and didn't believe that e-cigs would offer them the same experience, which is understandable. However, the research also revealed that, for around 30% of smokers, "I think e-cigarettes might be harmful to my health" is given as a reason as to why they had not tried, or did not intend to use e-cigs. Now, I don't know what the percentage switch rate is currently, but that means that tobacco control hysterics have convinced between 3 million and 4 million smokers that they should steer clear of vaping because it is equally or more harmful than smoking. It's never really been about health, has it? The good news, though - as I've said many times since I first wrote about them in 2010 - is that the more vapers there are, the more shrill and absurd detractors become and the more the public will realise that governments and 'public health' are lying their arses off about smoking alternatives. This EY report has assessed that the e-cigs market is currently worth around £6.1bn, up from £700 million in 2010, and predict that this will increase to around £12bn in 2020. Just imagine how much that must smart for certain insane moon-howlers in California, Sydney and the London School of Hygiene and Tropical Medicine, eh? After doing some online research, I got my first electronic cigarette kit from VaporFi. Hey! Bloggers, Leave Our Junk Alone!